This special event is administered by Simply Lean Business Solutions. Auckland companies have the opportunity to learn from one of the world’s leading lean manufacturing practitioners and trainers. 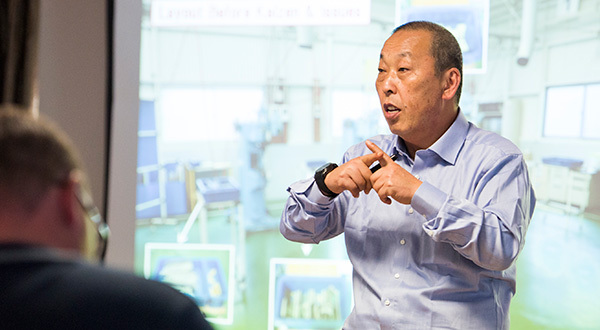 As a Toyota factory manager and kaizen leader, Hyodo Sensei has built a 40 year career fostering the Toyota Production System within Toyota, its supply-chain, and more recently within non-automotive companies. The master class will be led by Hyodo Sensei, a long-time TPS leader and former factory manager at the Toyota factory in Japan responsible for the manufacture of the HiAce vehicle. Now retired as a factory manager, Hyodo Sensei heads the kaizen training arm of that Toyota factory providing lean training courses for companies in Toyota’s supply chain, and hosts the training component of the annual Australian Industry Group Lean Japan Tour. This master class is designed for senior managers interested in fostering a culture of continuous improvement within their organisation. You will learn first-hand about how process improvement is achieved within Japan’s leading companies, and more importantly, how to implement these practices within your operations. Particularly relevant sectors include manufacturing, food and beverage, mining, wholesale & retail trade, and transport. This two-day master class will focus on the application of lean principles and the Toyota Production System (TPS) to sectors outside of automotive. The course will go beyond theory to discuss how lean thinking can be implemented and sustained within a company. The course will also include an overview of the operations at the Toyota HiAce factory in Japan, as well as an afternoon tour and mini diagnosis at Fisher & Paykel Healthcare. Registrations and questions should be directed to Simply Lean Business Solutions.